– China Halts GMO Grain Imports From The U.S.
As was expected, Big Biotech’s legal juggernaut has rolled into action in Hawai’i. On Friday afternoon, three big agrochemical companies—Pioneer-DuPont, Syngenta and Agrigenetics Inc. (a subsidiary of Dow Chemical)—filed a suit in a federal court in Honolulu seeking to block Kaua’i County’s new genetically modified organism (GMO) regulatory law. 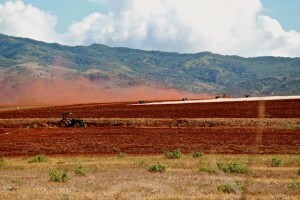 Two other big agribusiness concerns on the island that will be affected by the law—Kaua’i Coffee and BASF—haven’t joined the suit.The law, Ordinance 960 (formerly known as Bill 2491), was passed in November after surviving a veto by Kaua’i Mayor Barnard Carvalho. 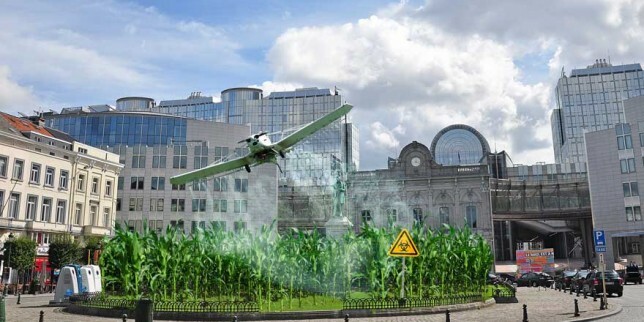 It requires agricultural companies and large farms to disclose the type and volume of pesticides they are spraying and the location of their genetically modified crop fields. It also requires the companies to set up buffer zones between fields growing GM crops and public places like schools, hospitals and parks. The law is scheduled to go into effect Aug. 16. A similar regulatory bill was introduced on the island of Maui in December, just days after the mayor of Hawai’i Island, Billy Kenoi, signed into law a bill restricting biotech companies and farmers from growing any new genetically modified crops on that island. The zeal with which GM proponents evangelize transgenic seeds (and now, transgenic food animals) is so extreme that they are even pouring vast sums of money to defeat popular efforts to simply label GE foods – like the nearly $50m spent to defeat the popular 2012 ballot measure to label GE foods in California, Proposition 37. What’s more, it’s not just happening in the United States. I am the head of Food & Water Watch, and we have spent months looking at the extent to which the US State Department is working on behalf of the GM seed industry to make sure that biotech crops are served up abroad whether the world wants them or not. Our report analyzes over 900 State Department diplomatic cables from 2005 to 2009 and reveals how far the US government will go to help serve the seed industry’s agenda abroad, knowing that resistance to GMOs worldwide is high. Electronics firm Pioneer is axing 10,000 employees as it pulls out of the flat-screen TV market by March next year and predicts a record annual loss. The Japanese firm, which employs some 37,000 worldwide, is also searching for a joint venture partner willing to take on its optical disc businesses.